At Timeless Sashes we believe the sliding sash window is a national architectural treasure. Sash windows are an essential feature of period buildings and should be respectfully maintained to retain the aesthetics and value of such properties. We draw on our years of experience to provide a range of services to help you restore your sash windows to their former glory. Timeless Sashes provide a free quotation service. If you are unsure about your requirements we are happy to advise you on how we can renovate your sash windows to restore their operation and appeal. As well as basic and comprehensive renovation options we can also advise on the benefits of draught-proofing. 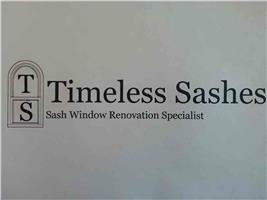 Timeless Sashes also offer a re-glazing and painting service. We aim to provide you with a quotation within 7 days of us completing a survey of your sash windows. The quotation will include details of the work you require and a breakdown of any extras requested such as sash window furniture or security options. We want you to feel comfortable about the work being undertaken in your home or place of business. Before we start work we move all furniture a safe distance away from the work area with all blinds or curtains removed and replaced upon completion of the work. Dust sheets are placed over furniture and carpets. Furniture is moved and replaced in its original position, with all work areas vacuumed daily. Throughout the period of work being carried out we will keep you notified of our progress. Upon completion of the work we will provide a full demonstration of the workings of all the sash windows we have worked on to ensure you are fully satisfied with the work undertaken.